A chamber of commerce has threatened to lodge a formal complaint over a local authority's handling of its plans to boost tourism in Stranraer. The Wigtownshire group is unhappy at Dumfries and Galloway Council's approach to its proposal for steam train and cruise ship tourism. Chairman Peter Jeal said the authority had not given it serious consideration. The council said it had offered a further meeting with the organisation to explore the issues raised. Earlier this year a report produced by the chamber of commerce claimed that existing pier and train facilities could unlock millions of pounds for the area. 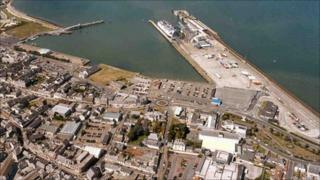 Major changes are on the horizon in Stranraer with Stena Line moving its ferry port out of the town to a site nearer the mouth of Loch Ryan. Dumfries and Galloway Council has prepared a master plan for how to regenerate the waterfront area in light of the situation. However, Mr Jeal said his organisation felt that document was missing a chance to assist the region's tourism. "Having now seen a copy of the approved master plan, we see that the council's stubborn refusal to consider alternative possibilities to its new station remains," he said. He said that was despite evidence that what the council was proposing could "kill off Wigtownshire's chance to capitalise on this potentially lucrative market". In a written statement, the authority said it had offered a further meeting with the chamber of commerce. The council also stressed that the waterfront master plan and the 12-month consultation used to develop the document had been widely endorsed by local groups.